"The building was new and our family room was spotless clean." "The breakfast is ok, the room is clean and neat." "Very clean and nice Jjimjilbang." "We were impressed by the clean room and pool." 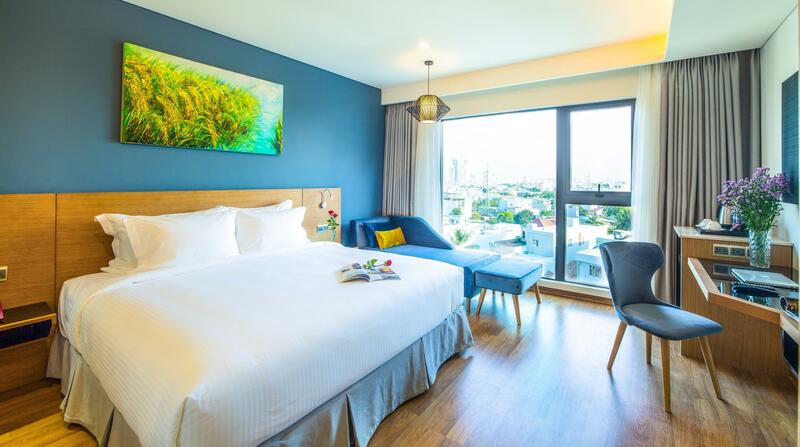 Well-placed in the family fun, sightseeing, beaches area of Da Nang city, Nam Hotel & Spa provides a most conducive spot for you to take a break from your busy days. From here, guests can enjoy easy access to all that the lively city has to offer. With its convenient location, the hotel offers easy access to the city's must-see destinations. 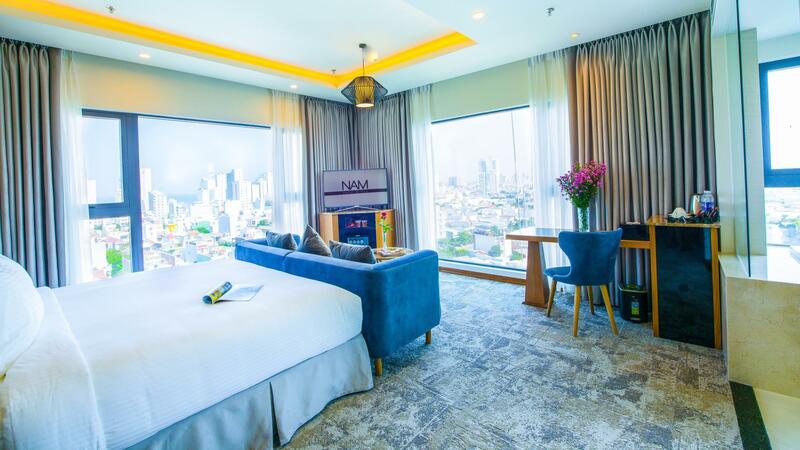 The facilities and services provided by Nam Hotel & Spa ensure a pleasant stay for guests. The hotel offers access to a vast array of services, including free Wi-Fi in all rooms, 24-hour security, daily housekeeping, fireplace, gift/souvenir shop. Hotel accommodations have been carefully appointed to the highest degree of comfort and convenience. In some of the rooms, guests can find television LCD/plasma screen, carpeting, complimentary instant coffee, complimentary tea, free welcome drink. The hotel's fitness center, sauna, spa, steamroom are ideal places to relax and unwind after a busy day. 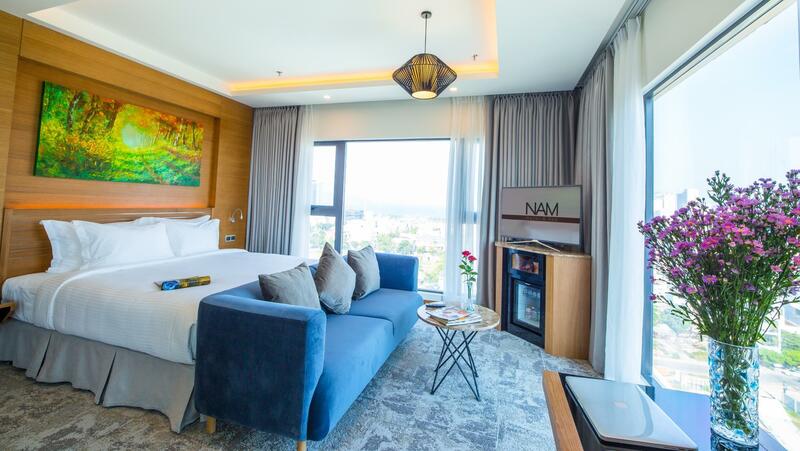 Superb facilities and an excellent location make the Nam Hotel & Spa the perfect base from which to enjoy your stay in Da Nang. "The breakfast provided are all yummy." The hotel itself is great value for money. Clean, nice rooms, great beds and excellent staff. Unfortunately the spa service was terrible. I had the most expensive and worst massage I’ve ever had in Vietnam. Would stay again but skip the spa. 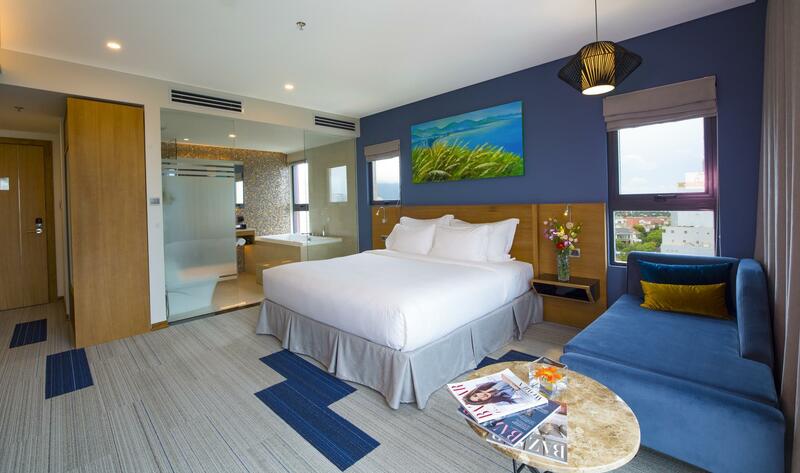 Large modern room with comfortable bed and sofa, large bathroom and strong shower. Buffet breakfast is good. I booked this hotel because I wanted to try Jjimjilbang after I read the previous reviews, but was told it's permanently closed during check in. Agoda should mention it in the facilities part. Anyhow, steambath and normal sauna are still available. This hotel is still the best choice in Da Nang. It was good place for our couple. One thing was not good that was rental bike service. During day time, I told a staff the rental bike had a problem about strating the engine. That bike was rental from Nam hotel. Sfaff said to me, "Any time it happens problem on the road, call Nam hotel." As it happened, Motobike stopped on the road and starting butoon didn't work at night time. I called Nam hotel, one of staff told me to park the motobike near the another hotel and pick up taxi. But, we couldn't take a taxi, because there was no taxi around us. So, we came of foot Nam hotel. the more disappointed thing; Next day morning, Nam hotel gave me same motobike and same problem happened more several times. Fortunately, it was day time, and strating botton worked every each time. We received excellent services from the staff. They were very polite and helped us to book our tours. We love the open air swimming pool. The hotel is about 10mins walk to the beach with many seafood restaurants around. Highly recommended this hotel! The hotel was clean and staff were nice. Roof top pool was nice but very windy and cold even during late afternoon. Breakfast was good esp the traditional vietnamese noodle. Location wise was at the middle between the beach and the downtown. Both were walkable within 15-20mins. Grab was the cheapest option other than by foots. Nearby Vincon plaza shopping mall was around 20mins slow walk from the hotel. The only disappointment was the Korean free spa was under renovation till May 2018!!! Frankly, I chose this hotel because of the free spa! The hotel should have informed the customers earlier or at least announce it on its website or on agoda! Nevertheless the staff were nice. We did enjoy our stay with Nam Hotel and Spa. Location is not much far from the beach. 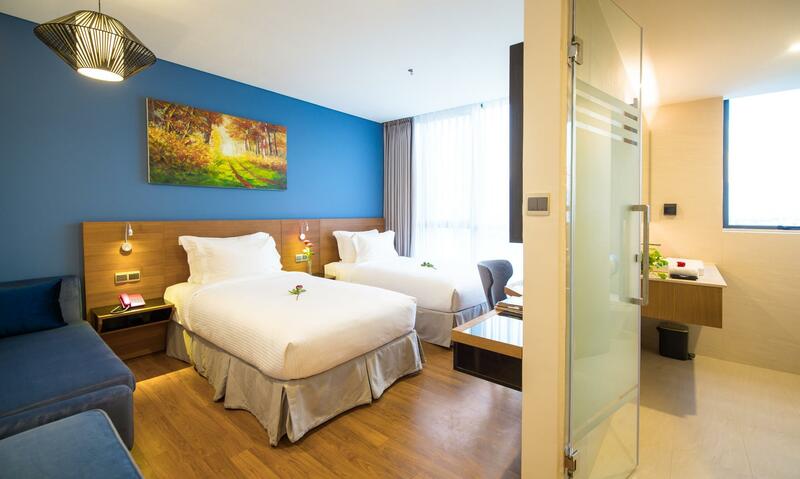 Clean and good condition of room, however, it is vulnerable to soundproof and doesn't has balcony. Roof top bar is good. Breakfast is normal. Cheap price with satisfactory room. 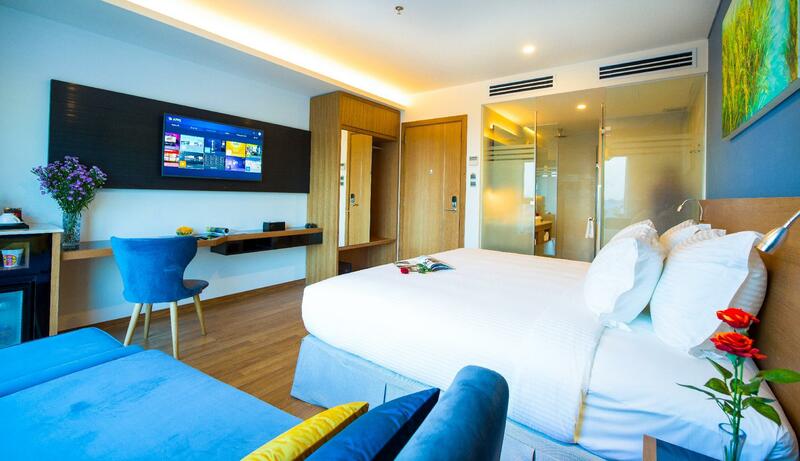 The hotel room is clean ,big and the design is contemporary. Check in a bit slow,we waited for an hour coz the room not ready but the front line staff is very polite and helpful. The buffet is good although not much choise. The location is near to the beach . Very clean and nice Jjimjilbang. Room was spacious and cool. Good amaneties. Around the hotel - a bit deserted. Check in receptionist - a little improvememt is needed. Staff at the Jjimjilbang was kind. 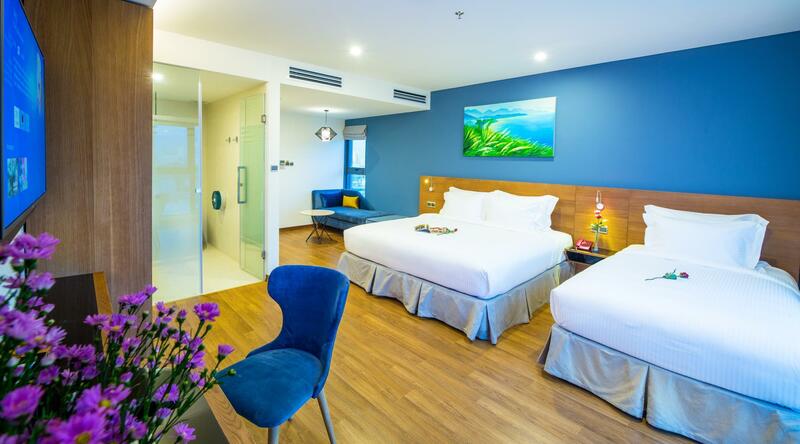 This hotel is located 8 to 10 mins walk from Vincom Plaza and about 5 minutes to the beach. Upon check in, there will be 2 free drinks coupon for you to enjoy at the rooftop bar. There will be 2 free entrance coupons for 2 persons to the sauna or jim jil bang. However, the receptionist forgot to give and I have to go the reception and asked for them. This hotel is really clean, new and spacious room. Wifi signal is strong. Good breakfast and coffee. The only disadvantage is the hot water. After 1 person took a bath, the other person will have no enough hot water to bath. I really hope the hotel can improve on this. In conclusion, I highly recommend this hotel. I will definitely come back for sure. Our stay was great, the staff, room and wifi was excellent. It had a Korean suana called JJB, and was great. Had good excellent spa and massage at hotel. Conveniently located near Miki beach and walking distance to the city areas. I booked this hotel because another reviewer commented on how comfortable and soft the beds are. They are so so soft and comfortable, which is a welcome change from most other places I stayed in Vietnam. Just for that I'd stay here again if I find myself in Danang. The hotel has a jjimjilbang (Korean style spa) on premises and they gave us vouchers to use it for free. It's quite small but is good enough, with two pools with hot and cold water and steam room, and individual chambers with infrared lights, plus the massages are reasonably priced and the quality is good. They were remodeling the salt block room when we were there though. They also provided us a free voucher for a welcome drink on their rooftop terrace. They have a nice pool up there but it was too cold during my stay to use it. Overall I was very happy with this hotel, the cleanliness, the service, and the amenities. We were very happy with the hotel because we love the breakfasts there. Dying to go back again just for that and the sauna experience was free for my husband and myself for two nights ' stay. A little off the seafront but with enough local seafood and other restaurants nearby. Easily go up Monkey Mountain from here. 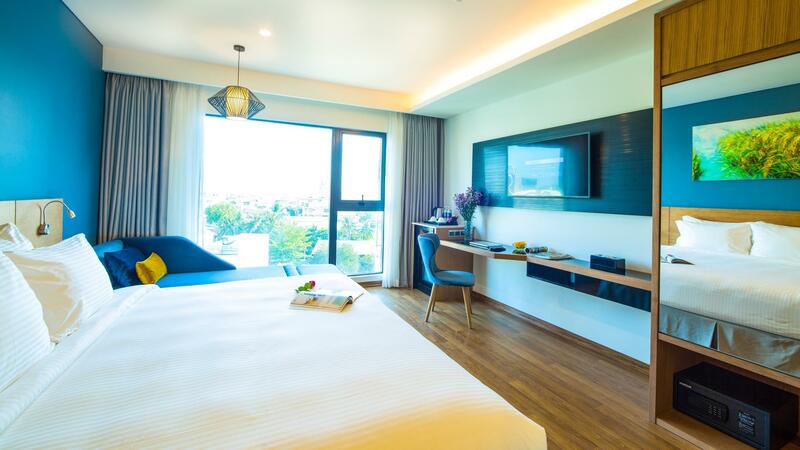 Service levels cannot be faulted at this new addition to Da Nang's line-up of three-star hotels. From check in to "See you again" when leaving, they were all smiles. Even a room-service girl we passed in the corridor took time out to greet us in English. We were also surprised by the other room staff - two guys processed our room one day: fast and efficient, Room amenities are worth an extra star as there is nothing cheap or unbranded in the bathroom - for once, toothbrushes that remove more than they leave behind, There is no loading of prices for room service, and there is small mart downstairs for extras. The only grumble was that we unable to access the top floor with its pool and bar (the wet season, you understand), not to mention that two days were just not enough to luxuriate in such a wonderfully comfortable bed. Staff is able to communicate in fluent English, very friendly and helpful. Room is spacious and clean, variety of food served in breakfast. Free trail of the Korean sauna room, very clean. Overall is value for money! Highly recommended! This bed is one of the softest and most comfortable beds in all of Vietnam. Our first room smelled like cigarette smoke so we called down to the desk and they immediately got another room ready for us and moved us there. The customer service was great and I would never dock them stars just because one room smelled of cigarette smoke. Thank you for a great stay Nam! the family room is very clean, neat, new, the beds are excellent, the view is perfect as we can enjoy the city view, the staffs are friendly and helpfull when we had a problem with some noise from room above ours, the night staff went straight to our neighbor to fixed the problem. Thank you & we really appreciated it, so we could have a good sleep. They provide a korean spa, unfortunetly we didn't have time to enjoy the spa. We will stay there again when we have chance to visit Danang. Close to beach. Food available until late. Great pool with a view. Negative.... cold fried eggs every day! Good choice if on a budget. This hotel is not fancy but is in a good location, very good staff and very comfortable beds. The rooms are clean and well laid out. This was one of the few hotels that offered space for three in a room. We hired the hotels car and driver named Peter and he was excellent. If you are looking for a reasonably priced room that is relatively new with great beds, this is the place for you. The staff were also always very helpful.